In this video we will discuss about displaying images in gridview control. There are 2 ways display images in gridview. In this video, we will discuss about using TemplateField and in our next vidoe we will discuss about using ImageField. We will be using tblEmployee table for this demo. 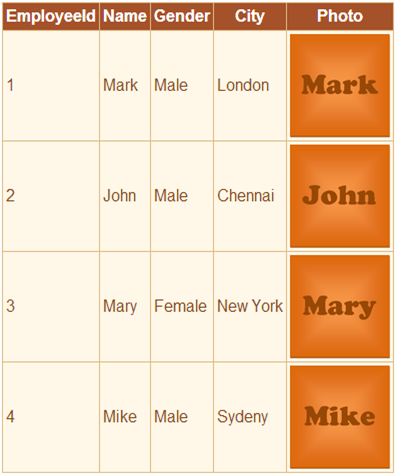 Please use the sql script below, to create and populate the table. Create an asp.net web application. Add a class file with name EmployeeDataAccessLayer.cs. Copy and paste the following code. Drag and drop gridview control on WebForm1.aspx. Copy and paste the following code in WebForm1.aspx.cs. 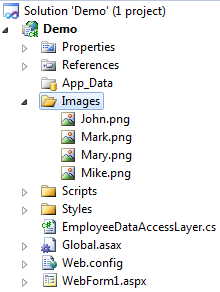 Add a folder with Name="Images" to your web application. Copy and paste any 4 images into "Images" folder. The names of the images must match with what we have in the database. After you add images, the folder structure in solution explorer is as shown below. Run the application, and notice that the image path is displayed in the gridview instead of displaying images. Add 4 BoundFields and 1 TemplateField to GridView control. The HTML is shown below. 1. The templatefield is used to display photos of employees. 2. In the ItemTemplate we are using Image control. 3. The "ImageUrl" property is set to "Photo" property of "Employee" object. 4. To control the size of the image in GridView control, set the Width and Height properties. We have set them to 100X100 pixels. 5. Finally set GridView1 control's AutoGenerateColumns property to "False"
EmployeeDataAccessLayer is not visible in my WebForm1.aspx.cs. Error is the name 'EmployeeDataAccessLayer' does not exist in the current content.By default namespace is not included in my cs file when I manually add it then I get a error 3 different errors. When you create a class it asks you to save it in web_app folder say "yes".